Fort Worth is a rapidly growing city, and that means a hot real estate market for homebuyers and sellers. In a city so diverse, that also means a hectic market that can be tough to navigate. Of course, navigating that is our specialty, and we are ready to serve. One smart buying choice is intercepting a neighborhood on the rise. We love our city’s high-profile, sought-after neighborhoods, but we also find great value in the hidden gems. To optimize your dollar, here are a few areas we think are worth a look. 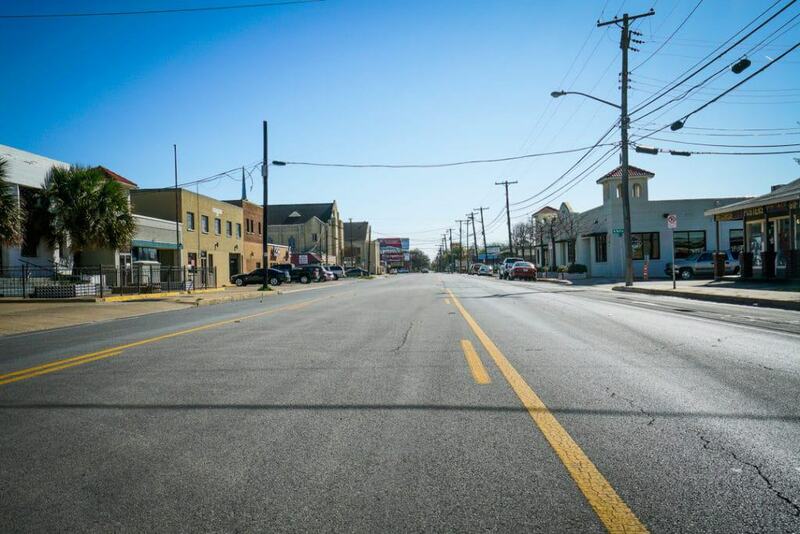 The position of this near-northwest Fort Worth neighborhood is what gives it such charm. It is quite tucked away among neighborhoods, not far from Westover Hills and Arlington Heights. Its other prominent neighbor is the beautiful Trinity River, with several homes allowing access to the trails. Those trails lead you to nearby Rockwood Park or straight to the newly reconstructed Airfield Falls Trailhead, a one-of-a-kind park that showcases the city’s aviation history and only natural waterfall. But don’t let the sound of that river and neighborhood coziness fool you. A quick trip down Roaring Springs Road and these residents have access to plenty of shopping, a gym and other amenities. Even the Joint Reserve Base might come in handy if you have military access (or just enjoy listening to the sound of freedom). Speaking of the Base, these largely 1950s houses harken back to the days of Carswell Airforce base with the kind of simple homes often found around military installations. What comes with that is a neighborhood built around, well, neighbors. The kind where people go in the yards, know each other and look out for one another. These homes also are often recently updated or ready for a buyer to make custom choices. Average home prices have doubled here in the past year, no doubt due to the burgeoning River District. The development is still early, though, and we think there is still room to get in on the upswing. Burton Hill Elementary houses one of Fort Worth ISD’s only Dual Language programs and is known for its low student-teacher ratio, recognitions from the state, and being home to this year’s district Reading Chair for Teacher Excellence. How do you feel about green? From the huge trees to the large lots and the abundant park space, you’ll see a lot of green in Meadowbrook. It’s not unusual to find half-acre lots and 40-foot trees in this established neighborhood, and the diversity of parks is nothing short of remarkable. 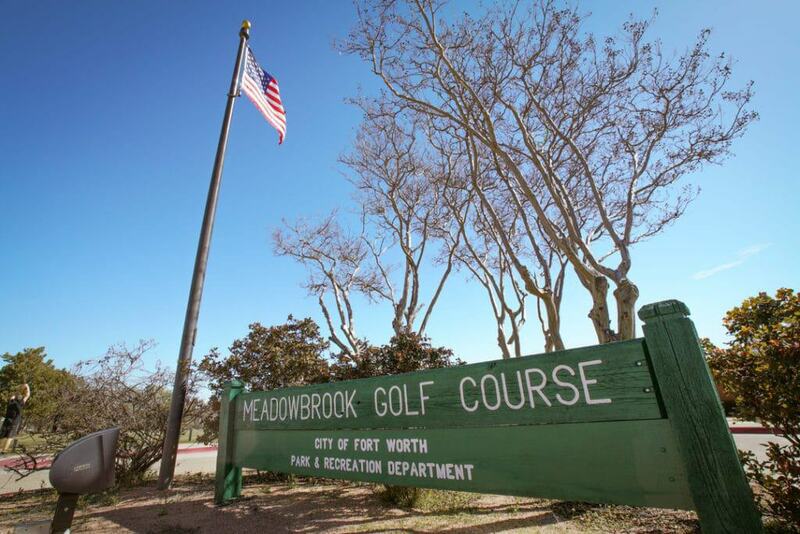 Meadowbrook is home to a player-favorite municipal golf course, the hidden gem of Tandy Hills Nature Reserve, sprawling and amenity-laden Oakland Lake Park, and is a hop away from the expanding Gateway Park and Trinity Trails. This neighborhood has an enviable mix of quiet seniors and growing families among the diverse real estate. A majority of Meadowbrook homes were built in the 50s, but the lack of broad scale development means that homes here span literally 100 years of architecture. Occasional modern-era and new builds join mid-century moderns sprinkled in among ranch-style homes. The beloved Meadowbrook Drive alone will take you from four-square to Spanish to Colonial. Where the eclectic Meadowbrook Drive meets the tree-canopied Oakland Boulevard sits the Firehouse Gallery, a 1928 prize that enjoys a storied past of a (you guessed it) firehouse, wedding chapel and now pottery studio and gallery. It’s home to Coffee Folk, a specialty coffee shop where neighbors sip espresso on the beautiful lawn Saturday mornings. 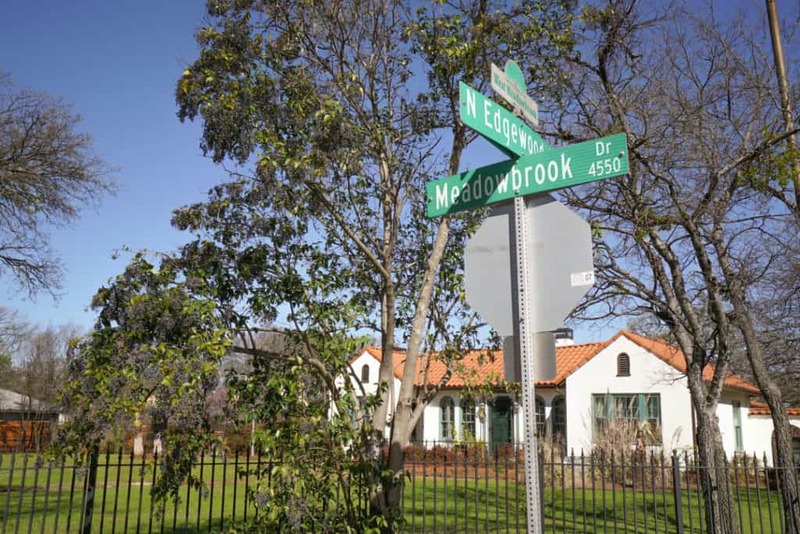 Nestled next to I-30, Meadowbrook enjoys incredible access, providing a straight shot eastward to Arlington or Dallas, westward to the Cultural or Medical District and positioning residents mere minutes from Downtown. The average price point in Meadowbrook has increased $30,000 in the last year. We think that’s solid evidence of growth, yet still plenty of room to get in on the rise. Oakhurst has long been a “well-known secret” for old home lovers in Fort Worth, but neighboring Riverside is earning its own identity. You may know it as the home of Martin House brewery if you’ve packed in there on a Saturday afternoon or, more still, as the location of the new Top Golf. 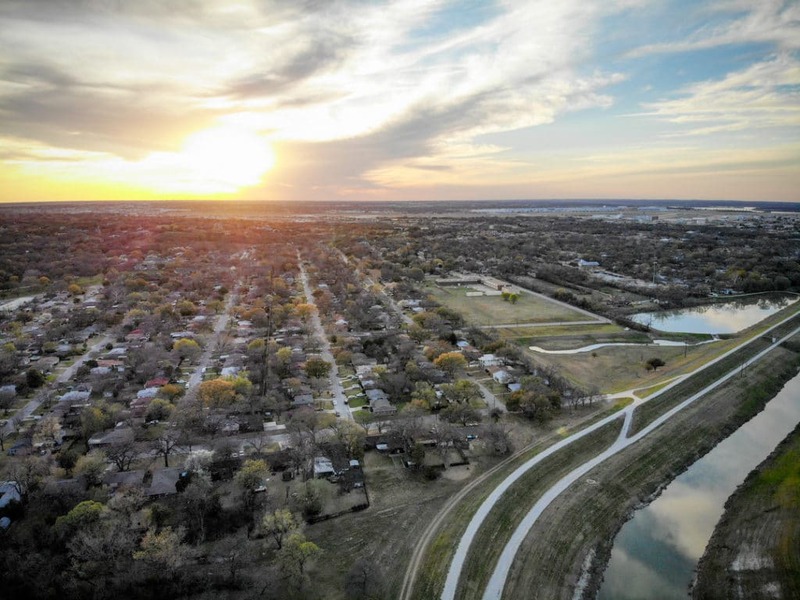 Both are next to an entrance for the Trinity Trails, which can take you to Gateway, downtown, the Stockyards or the nearby Riverside Park, which is undergoing extensive renovation as part of Trinity River Vision’s River Connect Plan. Riverside is also home to Six Points Urban Village, a revitalization project on Race Street that has us licking our lips. 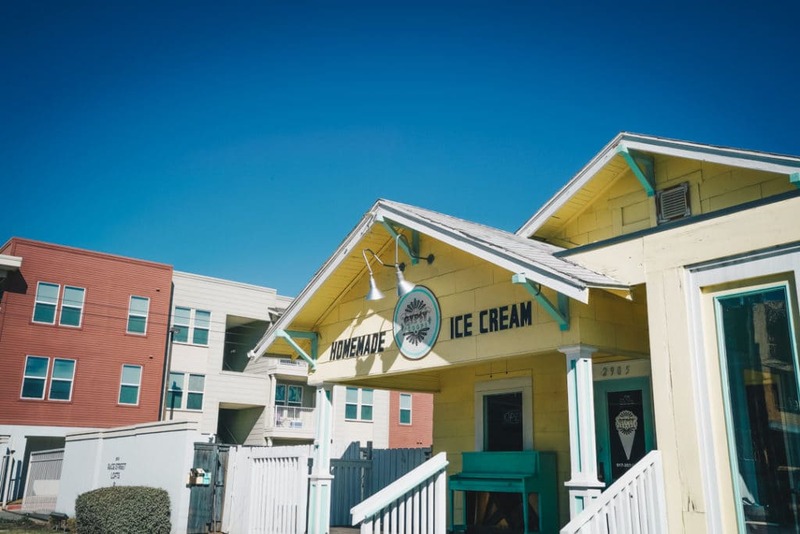 Gypsy Scoops ice cream, Roasted coffee shop and, soon, Kneady Donuts join long-timers Fuzzy’s and Mamma Mia to give this charming street a true urban vibe. Born Late Records adds to the nostalgia and fits in perfectly at the annual Race Street Rollick street fest. A mixed-use apartment/office/retail project under construction is sure to add even more fun and more traffic to its bike lanes. This neighborhood enjoys fantastic accessibility, literally five minutes from downtown and quick access to I-35, I-30 and 121. Much of the Riverside area feeds into Oakhurst Elementary, one of four Fort Worth ISD schools recognized as a 10 Top Gold Ribbon Elementary School. The homes here go back as old as the 1930s, many having been restored or being ripe for a new owner to come make it their own. So much to consider. 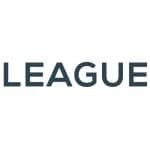 It’s these and other complexities that we at LEAGUE are ready and willing to help you navigate and find the ideal neighborhood for you.